Patti Boyd inspired George Harrison to write the Beatles love song Something. Layla, Eric Clapton's anguished love epic with Derek & The Dominos, was also conjured by her, as was Wonderful Tonight, the lilting love song EC included on his 1977 solo album Slowhand. Boyd met Harrison while the Beatles were filming A Hard Day's Night. The 19 year-old had been cast as one of the school girls in the movie. George and Patti got married two years later, in 1966. Eric was infatuated with Boyd, and won her over. In 1974, Patti left Harrison for Clapton. The couple married in 1979, but parted five years later. In 1990, Boyd met and fell for Rod Weston, a real estate developer. Last week, Boyd & Weston finally tied the knot. 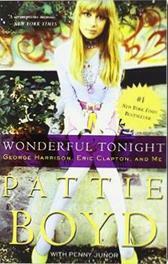 Boyd chronicled her years with EC and George in the 2008 book Wonderful Tonight: George Harrison, Eric Clapton, and Me. The accomplished photographer also recently made public a number of wonderful photographs she took while in the company of her first two husbands.